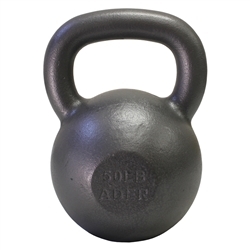 These Ader Kettlebells are fully cast iron, with a fully cast handle and no welding. Ader kettlebells are widely known for their outstanding handle quality. The gray hammertone paint provides a light texture that is not slick or slippery, making the handle ideal for both high repetition exercises and heavyweight pressing lifts. The perfect width of the handle easily accommodates both hands of men or women for two handed exercises.